I stopped by Newport News Park the other day before coming into work. I’m an avid bird watcher (“birder” is the term used in the birding world), and I love to search for these beautiful visitors during migration. It was a gorgeous morning, and I was enjoying the quiet and solitude of looking around for some of my feathered friends. Suddenly I heard a lot of commotion above my head and knew the sounds were not bird calls. 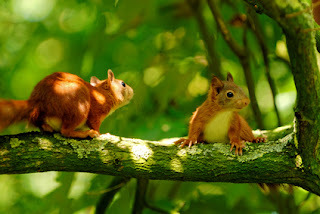 When I looked up, I saw two squirrels fighting on a limb about 20 feet above the ground. They were moving back and forth across the branch as though in a fencing match, and then one of them lost its balance and fell to the ground. Just shows what I know about squirrels. This one landed on the ground on its four feet and bounded off instantly to another tree. I stood there surprised and awed, watching the now-empty spot where this small creature had fallen just seconds before. The word “RESILIENT” popped into my head, and I got to thinking about an advantage these small-brained mammals have over the more-evolved humans when it comes to springing back from defeat. The squirrel’s mishap that day was temporary. It fell, recovered, and moved on, without sitting around licking its wounds (literally or figuratively). We humans, on the other hand, often have a very different reaction to perceived insults or injuries. Just consider hurts of the emotional kind for a moment. When you experience disappointments or unexpected setbacks, how do you respond? Do you get over them quickly, spring back to your feet and promptly return to the game of life? Or do you sometimes let hurt feelings and your ego get in the way of a rapid recovery? You have the option to stay stuck when you get in a bad place. You can choose to wallow around in those negative thoughts and feelings for extended periods of time. And the longer you stay there, the more you'll overlook the positive things going on around you…and the opportunities that present themselves. The next time you face a temporary stumbling block, think of this squirrel. Then do what you can to work through it and move on. Fraid I'm not very resilient. I love to write, but I find all the "after the book" stuff to be difficult and tedious. I am sixty-five so maybe the resilient part of my brain is dying. I did a paper (a long time ago!) on resilience and the hardy personality because I was (and still am) so interested in how siblings in a family can experience the same events, including death of a parent, mental illness, etc., and yet 1 of 3 might emerge whole and resilient while the others are "wounded birds" for life. Would love to know if it's in the dna or learned. Beth, thank you for visiting - great to see you and your valuable insights about this important topic in the context of siblings. I'm 2nd of 6 kids (2 girls, then 4 boys) with 15 years between oldest and youngest. Big difference in my parents when parenting 1st and last children. I'm a big believer in both nature and nurture impacting people's development.